Casas Viejas is the home of travellers and nature lovers in the Sierra Nevada! 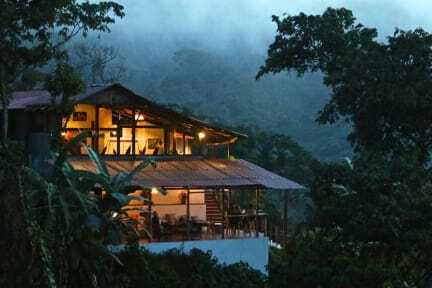 We are located at the heart of finca La Victoria, one of the biggest and most famous coffee farms in the mountains of northern Colombia, 30min from Minca and 20km from Santa Marta. 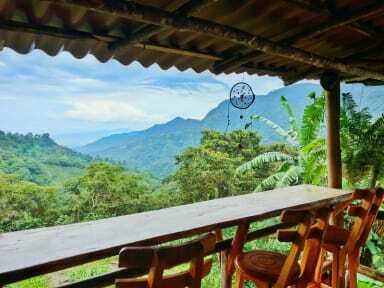 Keeping with the rustic style of the coffee haciendas of the region, we offer comfortable accommodation and a cozy atmosphere where you can relax, exchange with other travellers and enjoy stunning mountain views. Treat yourself with our delicious food – a blend of local and international cuisine – and savouring handcrafted local beers from the tap in our Jungle Bar. We also organise various outdoors and cultural activities (horse-riding, hiking, bird-watching, visit to the coffee factory, ...), designed to explore and connect with the luxuriant nature of La Victoria farm. We are also the perfect place to get a traditional indigenous massage or a morning yoga-stretching session in the middle of the jungle. Our hostel lodge is also the ideal place to start your hike to Cerro Kennedy, a summit from where you can see the amazing snowy peaks of the Sierra Nevada. **Important: For getting here from Minca, you can either take a moto-taxi or a jeep (30min ride), or walk all the way up to here for 2 hours. Please plan to arrive as early as possible, the gates of the finca close at 5:30pm and after this hour the way can get longer and more expensive. We accept payment with cash and credit/debit cards. A 4% commission applies for payment with card. Nothing to complain about! Completely incredible location, amazing and friendly staff who are all volunteering travellers themselves. The beds are so comfortable, the facilities are great (toilet and shower over looking the mountains), really comfortable beds, amazing food. It was the best place we have stayed so far in Colombia - no WiFi means that people all interact and there’s a wonderful atmosphere, so that wasn’t an issue at all. Great value for money- highly recommend to anyone. Unbelievably beautiful, incredible food, amazing staff. Worth the trip for the hot shower with the view over the valley. We did the Coffee tour, the coffee cake is outrageously good and you can also jump right off the middle of the Pozo Azul Waterfall. Incredibly fun weekend. Thanks. Loved Casas Viejas! What a beautiful, relaxing stay we had in this mountain haven. The views were amazing, the food fantastic and the staff extraordinary. Loved hearing the birds, howler monkeys and cicadas in the morning. Casas Viejas was the highlight of our family trip to Colombia. This is one of the most unique hostels or hotels have ever stayed. Really beautiful and an oasis for interesting travellers and like minded people that enjoy the world. Stunning views, great inclusive atmosphere. I stayed with my girlfriend but had been travelling on my own for weeks before and this place is fantastic for both. Hot water here of all places!!! And the view on the lower showers down the hill. My most memorable shower this year??!! weirdly. Excellent hostel! The perfect place to relax! Beautiful sunsets, incredible views and incredibly friendly staff! An amazing place! It’s the perfect spot to unwind and escape the buzzing noise of the city. The staff are friendly and helpful, the activities on offer are great, and you’re bound to meet other like-minded people at the communal dinner time or cozy bar area. Would highly recommend if you are a lover of the outdoors! I could not speak highly enough of this place. Absolute highlight of my trip to Colombia. A lovely chilled out vibe where people are wanting to chat and hang out, but it is tranquil enough to get a good night's sleep. Would recommend to anybody! Beautiful hostel with friendly staff and very homey atmosphere. Great breakfast!